Merry Christmas and Happy Holidays! Don’t miss out on this opportunity to SAVE BIG on 12 awesome SwimWays products! Our 12 Days of SwimWays holiday promotion includes deals on select products from our Aerobie, Coop Sports, Kelsyus and SwimWays brands! Use promo code: 12DAYS on Swimways.com when purchasing any of these items and receive 30% OFF! But don’t wait- this promo ends at 11:55pm on 12/14/18! Take relaxation time in the pool to the next level with the SwimWays Spring Float Sol Seat! This floating pool chair is a deluxe sit-up style float with a durable fabric cover and a patented inner spring around the outside edge of the float for greater stability in the water. The Spring Float Sol Seat features a supportive backrest and added inflation – it’s great for catching up with friends! The soft mesh seat allows water to flow through, helping to keep you cool on hot summer days. The inner spring helps to fold the float flat into three compact rings for convenient portability and storage. When folded, the Sol Seat fits into most luggage, making it a great pool float for travel. Jet Valve for faster inflation/deflation. Supports adults up to 250 pounds. Ages 15+. Paw Patrol Paddlin’ Pups are adorable character pool toys that move through the water all on their own. To operate, twist the winder on the toy, place in the water, and watch it go! A great tool for the learn to swim process – encourage kids with their favorite Paw Patrol characters swimming right by their side. Kids can play with them in the bathtub too. Each character sold individually. Ages 4+. Protect yourself from the elements with the Kelsyus Original Canopy Chair. This portable camping chair converts from a familiar quad-style camp chair into your own personal outdoor oasis. 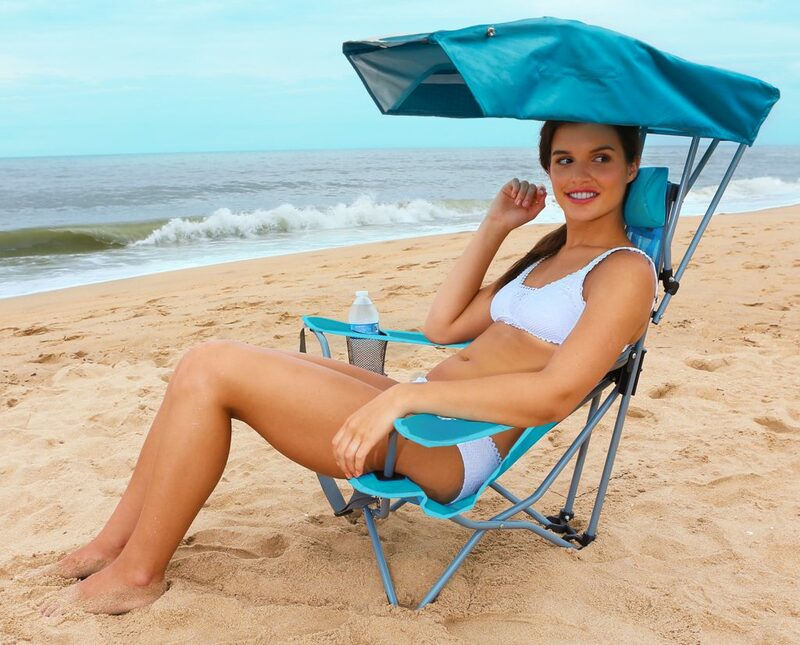 The sun canopy protects you from the elements with 50+ UPF sun protection and can be lowered behind the chair while you are still seated when you want to catch some rays. Super convenient, the Original Canopy Chair doesn’t need a bag. When folded, the canopy becomes the carry case secured by a durable snap-lock buckle, and the attached shoulder strap provides hands-free portability. Additional premium features make it the leader of the pack, such as an oversized seat with a rounded front edge for more ergonomic comfort, breathable mesh fabric to keep you cool, a large cup holder with o-ring for stability, and a sturdy powder coated steel frame that supports adults up to 250 lb. 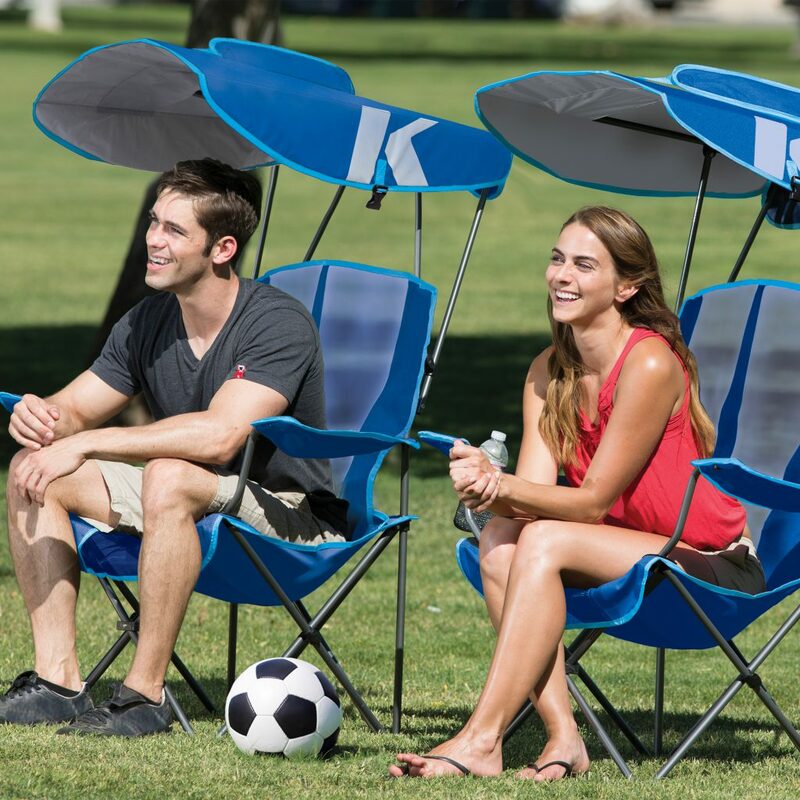 The Kelsyus Original Canopy Chair is the perfect companion for your family camping trips, tailgating, and watching the kids from the sidelines! 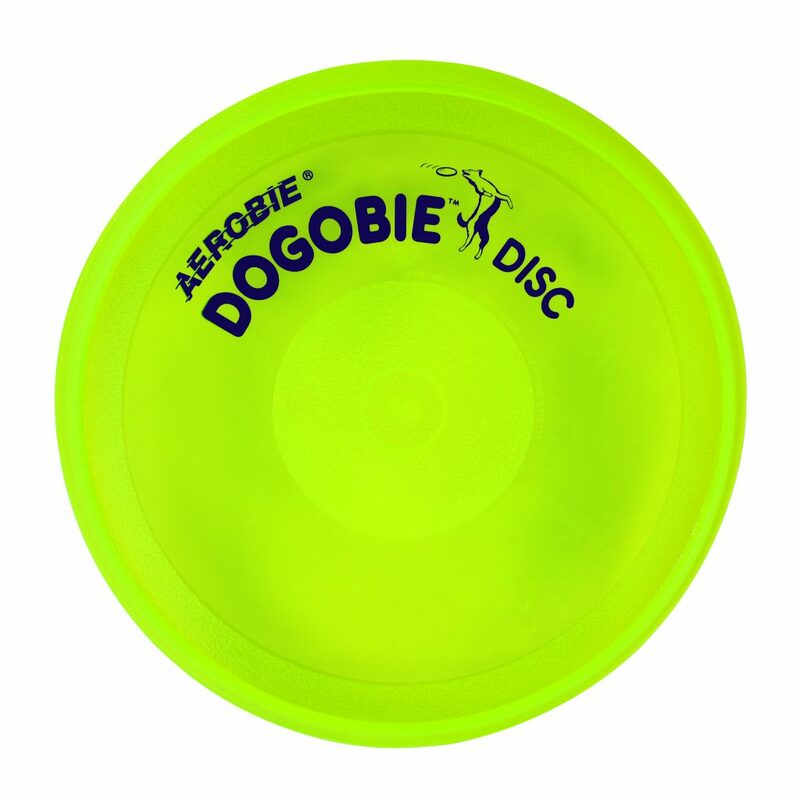 Dogs finally get their day with the Aerobie Dogobie Disc! We heard how much our furry fans loved their humans’ Aerobie discs, so we made one just for canines. The disc is made of a soft material that is gentle on a dog’s mouth and teeth and is tear and puncture resistant. The aerodynamic design is easy to grip and throw accurately so the whole family can enjoy a catch game with their favorite dog. Great for exercising and building a stronger bond with your pet too. 8-inch diameter. Take command of the waves on the Star Wars Millennium Falcon Ride-On pool float from SwimWays! You and your friends will have a blast blazing through the water like the intrepid crew of the Millennium Falcon on this durable pool floaty. When inflated, this inflatable pool toy measures approximately 46 in x 6.5 in x 61 in – a great size everyone can enjoy. Great for pool parties, vacations, and everyday pool fun! Makes a unique gift for Star Wars fans of every age and for collectors, too. For kids age 5 and older. Take your game to the backyard, pool, or beach with the Coop Hydro Football! This 9.25-inch football ball is 100 percent waterproof so you can play football in all conditions. Double-tuck laces make throwing easier and provide incredible grip in and out of the water. The soft cover features Coop’s trend-forward and beach-inspired patterns and colors that kids and teens love, and the heavy duty stitching and long-lasting air retention bladder delivers consistent performance. Get outside and play with this fun football for kids! For kids age 5 and older. The Marvel Oversized Inflatable Shield Pool Float is an officially licensed pool float from SwimWays featuring bold Spider-Man or Captain America graphics! 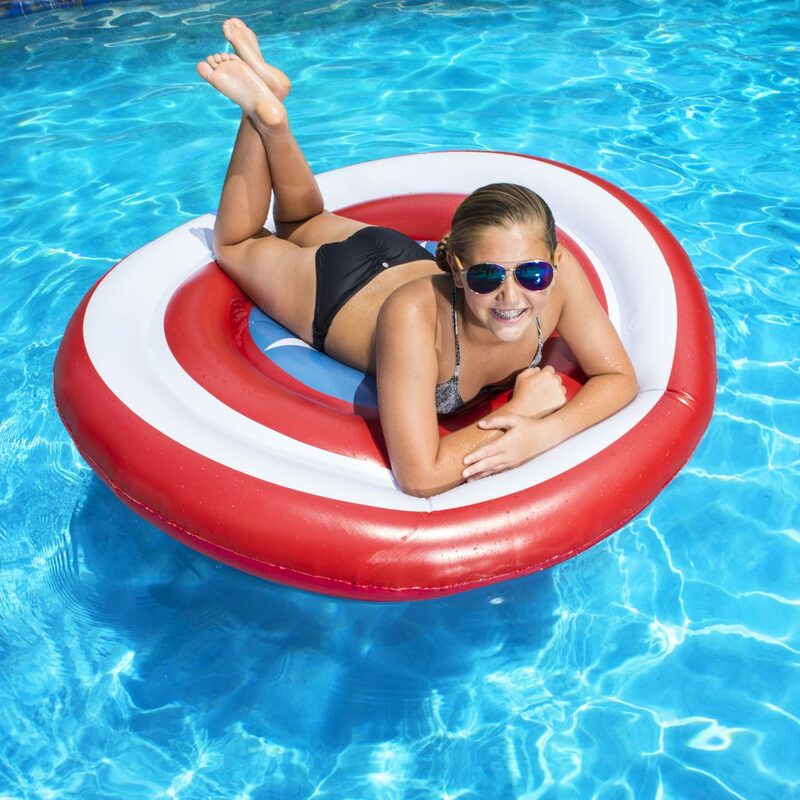 This fun pool float is 55 inches wide and 6.5 inches thick, a great size for kids of all ages. Perfect for pool parties, Marvel collectors, and for real-life superheroes who occasionally need a break from saving the world. Constructed of heavy-duty PVC and a quick-release valve for easier inflation/deflation. For kids age 5 and older. 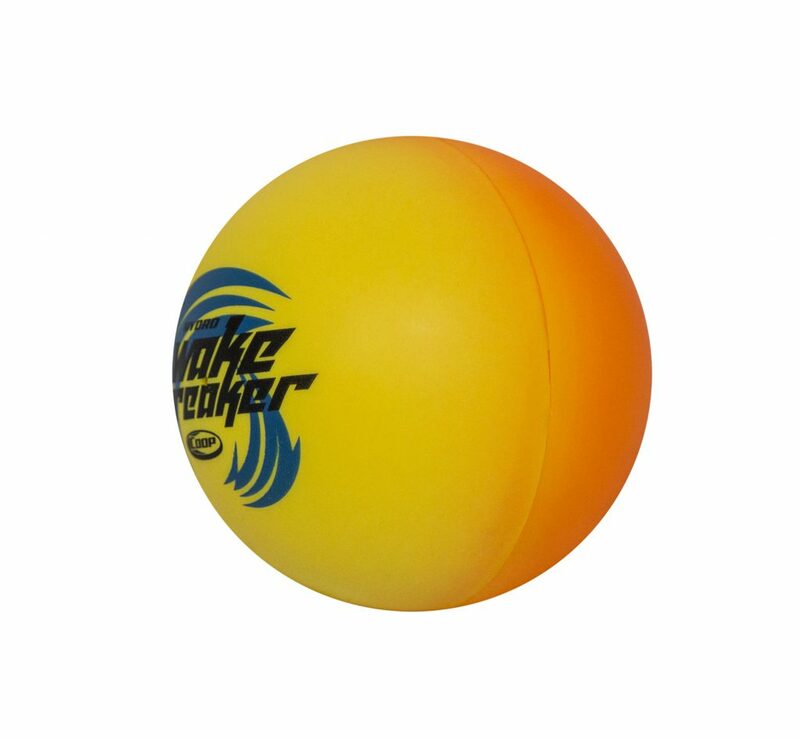 The Coop Hydro Wake Breaker ball bounces and skips on the water’s surface up to 75 feet! This toy ball floats making it easier to retrieve during play – no more searching for a sunken, water-logged ball. The bright colors are fun to play with and easy to see. Small in size, but big on fun, take the Hydro Wake Breaker with you on vacation and to the beach, lake, or pool. Dimensions: 3.5-inch diameter. For kids age 5 and older. The SwimWays Paddle Paws fabric-covered doggie pool float is built for your furry friends! 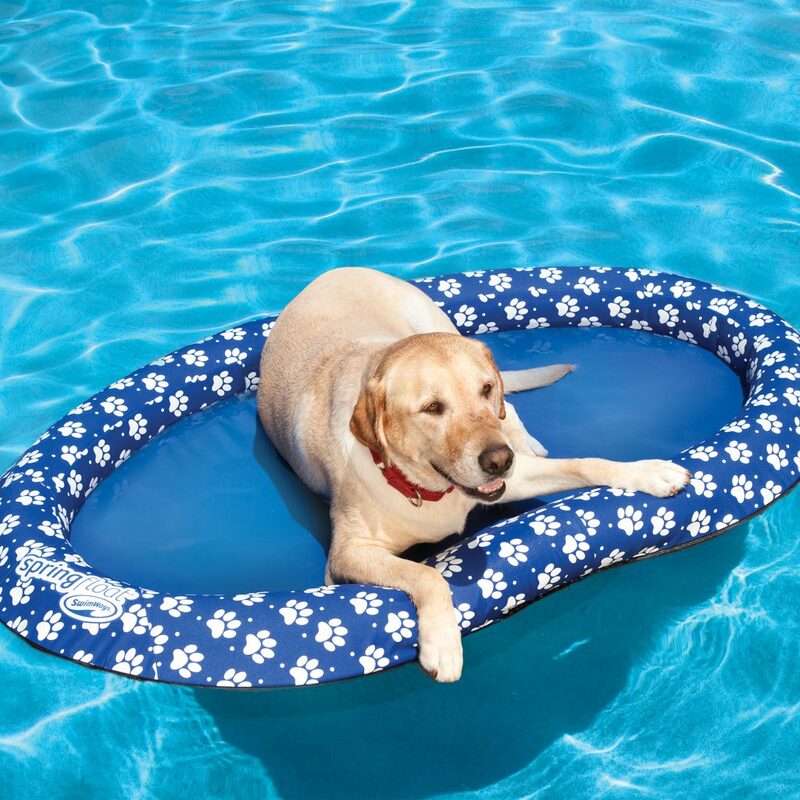 Your dog will love to cool off in the water in this durable pool float for dogs. With reinforced construction that is paw-and-claw-friendly, your pup will enjoy floating with you all summer long. The patented inner spring around the outside edge of the float provides greater comfort and stability in the water. Folds flat into three compact circles making it easy to take with you on vacation and store away when not in use. Large size supports dogs over 65 lb (30 kg). 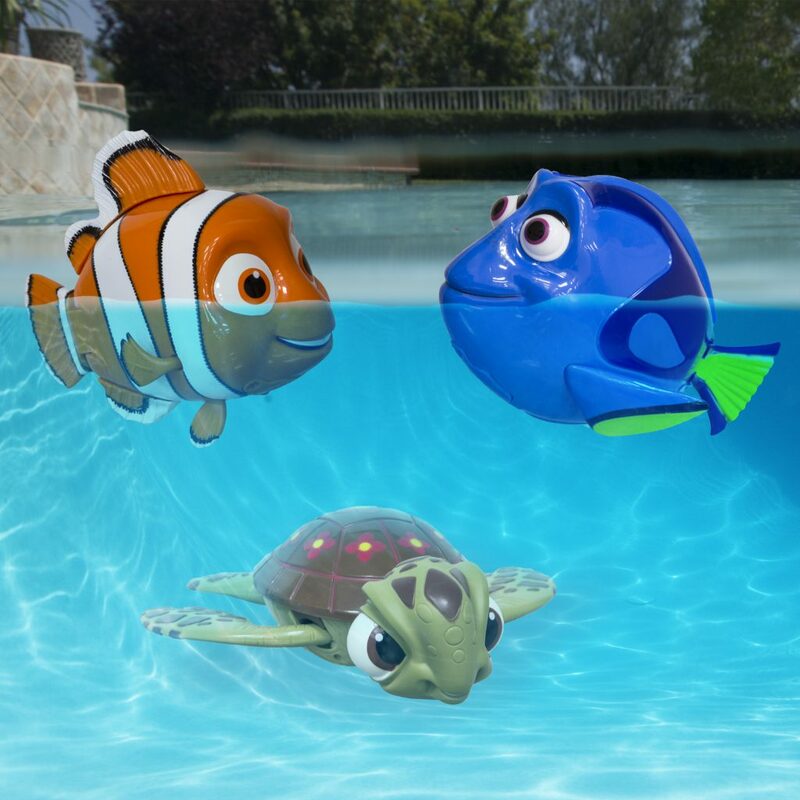 Your kids will want to just keep swimming with Disney Swimming Nemo, Squirt, and Dory motorized pool toys from SwimWays! The battery-powered real life swimming action of these toys is great for everyday play at the pool, encouraging young swimmers during swim training practice, and as a fun interactive decoration that will keep everyone giggling at your next kid’s pool party. To operate: 1. Install batteries according to directions on the package. 2. Activate the pool toy by pressing the button. 3. Submerge in water and allow the body to fill with water. Once filled, the product will balance itself and start swimming. 4. Enjoy all the smiles! Choose from Dory, Nemo, or Squirt– collect them all! Sold individually. Requires 2 x AAA batteries (not included). For children age 5 and older. Keep the fun going into the night with the Aerobie Skylighter Disc! 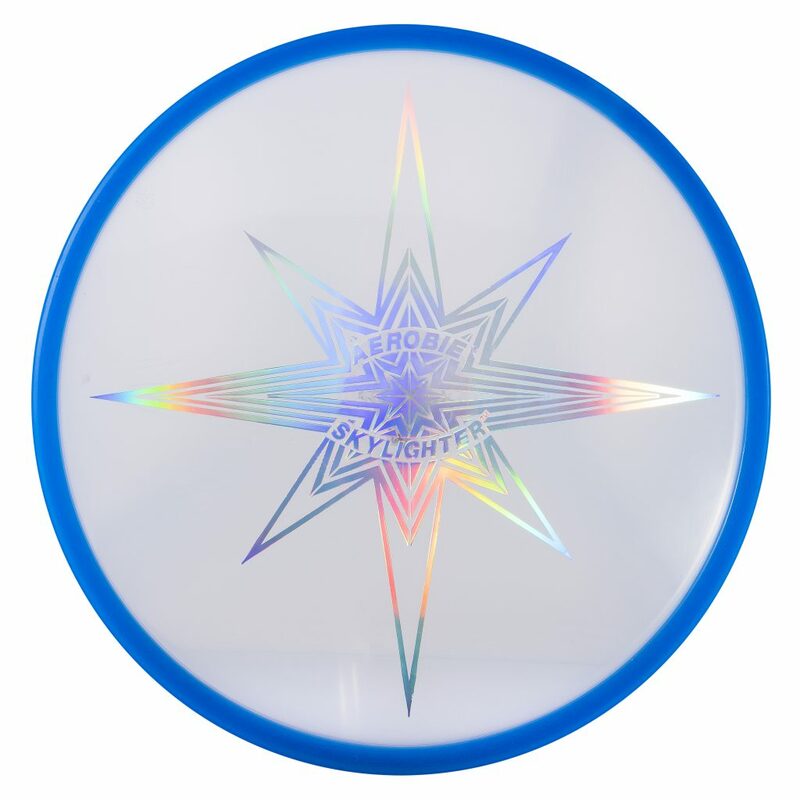 The super bright lights inside this light-up flying disc create brilliantly illuminated flights, adding to the fun. The Skylighter includes a spoiler rim for more accurate flights, a cushioned edge for excellent grip and a soft catch, a wide 12-inch diameter for greater stability, a sonically welded lighting module, and includes 2 long-life CR2032 (3V) Lithium Coin Cell batteries. (Batteries are replaceable.) Ages 10+. The Kelsyus Backpack Beach Canopy Chair is the perfect companion for your camping trip, beach outing, concerts and festivals, and watching sporting events from the sidelines. This camping chair sits low to the ground with the back at a slightly angled position for maximum relaxation. The seat is constructed of breathable mesh fabric to keep you cool on hot summer days, and the adjustable headrest and built-in cup holder allow you to relax with your favorite beverage by your side. The canopy easily converts from a sunshade to carry bag, and the built-in shoulder strap provides convenient portability so you can tote other belongings on your outdoor adventures. The Kelsyus Backpack Beach Canopy Chair weighs just under 9 pounds and supports adults up to 250 pounds.